New Canaan's Brielle Connelly (11) battles for the ball with Greenwich's Charlotte Gans (10) during a girls field hockey game at Dunning Field in New Canaan, Conn. on Tuesday, Sept. 11, 2018. 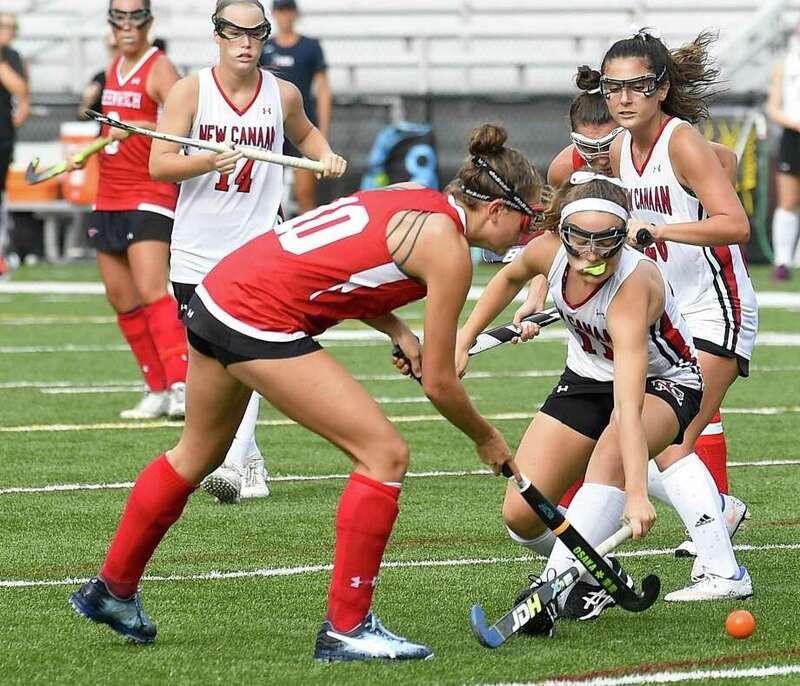 NEW CANAAN — It’s been just two games, but the underclassmen on the New Canaan field hockey team have already given reason to hope for the season ahead. The Rams responded to a 2-0 loss at the hands of Cheshire in their opener last week by shutting out Greenwich 1-0 Tuesday in their home opener. New Canaan got its first goal of the season at the 8:50 mark when Catherine Bopp was able to poke home a ball from a scrum in front of the cage. From there, the New Canaan defense was able to stave off a Greenwich attack that earned six penalty-corner chances in the second half — two with no time left on the clock. With 1:20 left in regulation Greenwich had an odd-man rush in front of the cage, but New Canaan freshman Rachel Gilio calmly brushed the chance away to preserve the lead. Gilio is one of five freshmen logging important minutes for the Rams, who also rotate in three sophomores. Gaeta, New Canaan. The netminder tallied six saves on the day to earn the shutout despite Greenwich earning two penalty-corners with no time left on the clock. Before the game, a moment of silence was observed in honor of John ‘Pepe’ Salerno, uncle of New Canaan player Brielle Connelly. Salerno was one of 2,996 people that lost their life during the Sept. 11th attacks 17 years ago. Records: Greenwich 0-1, 0-1 FCIAC; New Canaan 1-1, 1-0. Goals: NC—Catherine Bopp. Goalies: G—Maria Ciara Pereira (5 saves); NC—Emily Gaeta (6).